So, I went to the Loft weekend event. There were LOTS of new things in store, but the current color palette is not the best for my skin tone. Gives me a 'muddy' look. I brought my daughter because she LOVES the goodies that are in store usually for these events. But my store didn't have any LOL. She was a little bummed. Here it is on me in a misses Large. 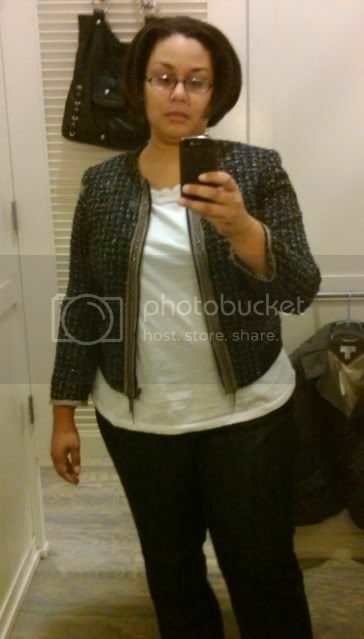 The large fit great, buttoned without gapping and was perfect in the shoulder. This one is a little odd for me. Its a zip jacket, and has sort of that stretchy bomber jacket waistband, so when you zip it it crops up even further. (boo) The XL was too boxy/large, and I felt this large was way too small. I am also considering a similarly fabricated tweed jacket from Speigal. Its a little cheaper than the Loft one, and no stretchy waistband. I found myself there on Saturday and it was bad news. Thank goodness they didn't have that tweed and chain jacket in my size, because I would have been really tempted! I like them all! You mean to tell me you didn't buy them all?? 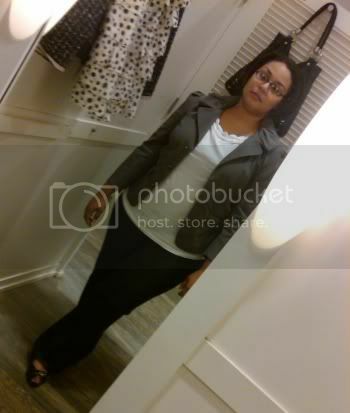 I fell in love with the last jacket after seeing it on you - Lol! It really didn't stand out on the Loft model (go figure). Did you happen to see if any other stores in your area may have it? Corie - I didn't buy anything. :-( Maybe if they are still around for clearance. Callandra - I know - I would never have looked twice at that jacket online, but its sooo nice in person! Wow love your outfit! The jacket's looking great...check out my blog if you please. I think I need a tweed jacket now. It looks great on you!! Tweed screams out ELEGANCE...or shall I say whispers elegance! That last jacket is just amazing. Hope you can find it in your size! Yes! I found an orange/coral cardigan that I can't stop wearing, and so many other items that I'd consider purchasing. I actually very much like the first jacket that you try, and the last one would be AWESOME if you can find it in the size that you need. Crossing my fingers that you luck out! the cropped jacket is divine on you! !